When it comes to energy consumption, calories count and fat and protein calories are the kings. In addition to providing a host of physiological benefits that keep your dog optimally primed, performance formulas contain the highest amounts of fat and protein and are therefore the most calorically dense kibble available. In short, your dog will get more energy from each bite and will require smaller rations. Through research, Purina has found that dogs with an empty colon, which takes 22 to 24 hours, have twice the endurance as dogs fed four hours before exercise. To maximize endurance levels during hunting and the ability to replace nutrients after a long day afield, feed your pooch one meal a day and make it supper. Allow him to cool down and then feed him 45- to 60-minutes after the completion of exercise. Extreme exercise and low humidity will deplete a canine’s water stores very quickly. To compound the issue, dogs often won’t drink adequately while working. Water not only replaces fluids lost via panting during exercise, it also aids digestion and the absorption of nutrients. In addition to providing plenty of opportunity to drink while afield, Eric Morris, a nutritionist with Fromm Family Foods, recommends adding water to your pup’s daily food ration or baiting water with kibble or beef blood. A 50-pound dog should consume between 2 and 4 quarts of water a day—that increases as physical activity does. 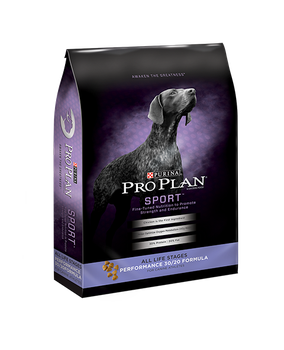 Premium or performance formulas provide around 30-percent protein and 20-percent fat, which gives your working dog the fuel needed to run at optimal levels. While they might cost a little more, performance formulas allow for more servings per bag, which makes cost differences minimal. Sufficient for dogs that go afield occasionally, maintenance formulas aren’t as calorically dense as performance blends and won’t provide as much energy comparatively. If you feed a maintenance diet, be sure to increase rations appropriately to meet your dog’s calorie needs. Several brands touting ingredients such as salmon, buffalo or duck line market shelves. If you feed one of these, check the protein and fat percentages as they often fall below even maintenance levels. Fromm Family Food’s Surf & Turf formula is one of the few that reaches the 30/20 level.